History: Frevag was formed during 1984 by Freddy Van Gaever. Core business was the lease of its aircraft to third parties including European Air Transport (EAT), Touraine Air Transport (TAT) and Air Limousin (ALTA). 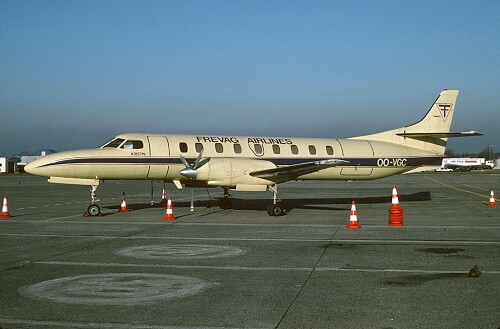 Frevag Airlines was created during 1989 after two Merlin returned from EAT, providing some charters from Antwerp. The same year, a contract was signed with Fedex to operate on its European parcel network, and both Metros were operated from the Brussels hub. On December 26 1989 Frevag Airlines was taken over by Servisair creating Flanders Airlines. In May 1992 the American company decided to drop its European network which finally led to the closure of Flanders Airlines on October 10 1992. Currently Frevag is still active as owner of VLM and some of its aircraft.